Feel like you have too much ‘stuff’ and are dreading yet another lackluster gift? Do you believe that the key to happiness isn’t about accumulating stuff but accumulating experiences? The above questions were our inspiration behind our latest Holiday promotion. Choose one (or more!) of the below graphics to let your loved ones know what you’d like them to get you. We’ll then let them know how they can get you a ticket to Toronto’s most unforgettable party. Tickets cost $125.00 and include access to an open bar, hors d’oeuvres, bumpin’ music and fun throughout the night! The event takes place on Saturday, March 29th, 2014 at 8pm at Andrew Richard Designs (571 Adelaide Street East, Toronto, Ontario). Email info[at]memoryball.org for more information on buying a ticket! Don’t forget to share over social media! Pin, tweet, ‘gram, post, link (in)! Sure to make some great memories. The perfect gift for the Wham! enthusiast on your list. We all have that one friend who’s a conspiracy theorist. Get them a Memory Ball ticket. 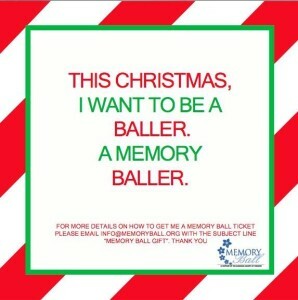 Show everyone how you [Memory] Ball out.